who were much more likely to turn to music, TV and movies. Derrick, Jaye L., Shira Gabriel and Kurt Hugenberg, 2009. "Social Surrogacy: How Favored Television Programs Provide the Experience of Belonging". Journal of Experimental Social Psychology 45: 352-62. Read more about Romance Series: Surrogate Communities? "The way I see it, [...] marriage is a lot like racing five-hundred miles at top speed. The only sensible way to tackle that big a challenge is a lap at a time. Right?" Shortly after this, of course, they discover that they do indeed have enough love to fuel them all the way to the end of the race, along with an ability to compromise which will make sure the wheels don't fall off their romance before they reach the finishing line. Varner, Linda. A House Becomes a Home. New York, NY: Silhouette, 1991. 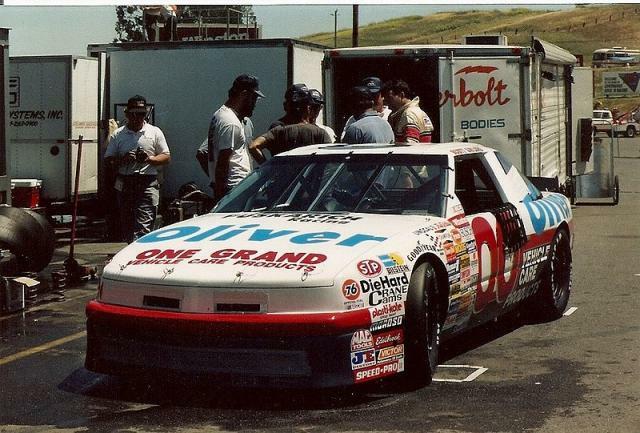 The photo is of "NASCAR driver Scott Gaylord's car, when he ran in the Winston Cup race at Sears Point in 1991" and was made available under a Creative Commons licence by Jay Bonvouloir. I came across it via Wikimedia Commons. "Husbandry" in this context, then, refers to "The care, cultivation, and breeding of crops and animals" (OED) but, as the existence of the word "husband" demonstrates, can easily be understood to have implications for our understanding of human romantic relationships. only seen examples of what not to do in a marriage. He had no idea how two people were supposed to act behind closed doors in order to have a successful relationship. Could a person exhibit behavior they'd never seen modeled before? He didn't know. He only knew it was a huge emotional risk. His eyes rested on the shadowed outline of trees across the pasture. He was accustomed to taking other types of risk, of course - that was the nature of ranching. Things like weather and market prices and the health of his herd were all subject to sudden changes, all beyond his control. He'd always accepted the ups and downs of his business, understanding that every drought would eventually end, every bad season would eventually be offset by a good one, every rough spot would sooner or later be replaced by a period of smooth sailing. He'd always taken a long-term view, rationalizing that if he just hung in there, and gave it his best effort, things would all work out in the end. But marriage was entirely different. Wasn't it? The question made him stiffen in the saddle. "for better for worse, for richer for poorer, in sickness and in health, to love and to cherish, till death us do part" (Book of Common Prayer). Cook, Nancy. “Home on the Range: Montana Romances and Geographies of Hope.” All Our Stories Are Here: Critical Perspectives on Montana Literature. Ed. Brady Harrison. Lincoln, NE: U of Nebraska P, 2009. 55-77. Wells, Robin. Plain Jane Gets Her Man. New York, NY: Silhouette, 1997. 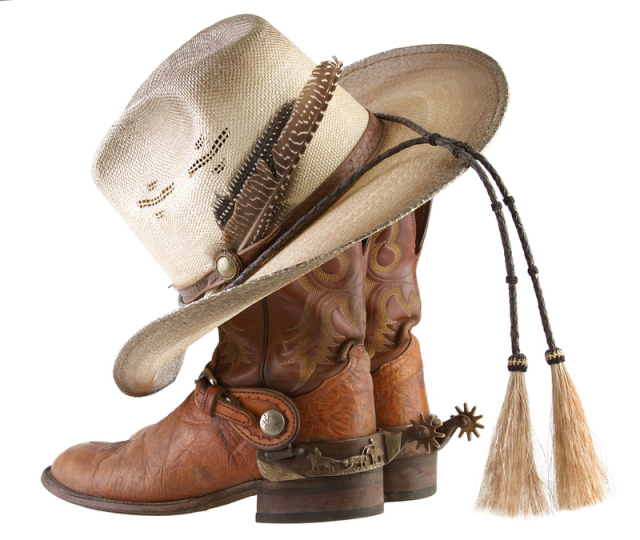 The image of "Cowboy Boots and Hat" was created by MaurieF, who made it available under a Creative Commons licence. I found it at Wikimedia Commons. Given how often criticisms of romance are interpreted as being, at their core, the result of the denigration of a genre associated with women, I was intrigued to discover that many of the negative responses to popular romance can also be found in the critical work on Hollywood movies. The common factor would seem to be happy endings, which are, apparently, commonly supposed by critics to be "a ubiquitous feature of Hollywood cinema" (MacDowell 1). "Probably the second most common scholarly assumption about the ‘happy ending’ is that it is inherently ideologically conservative" (3). Some critics have resorted to "Freudian psychoanalysis" (4) to understand their appeal. "narrative ‘closure’ is in itself ideologically suspect – a view rehearsed many times in both literary and film scholarship since at least the 1960s" (4).